Brad Costanzo is an entrepreneur, marketing expert, and investor. In 2000, as a young stockbroker investing everything he had – over $100,000 in savings – Brad lost everything he had within 3 months, going $15,000 into debt. A few years later, he earned it all back by learning about real estate investing, only to lose it all again when he bet on oil and gas well investments. He then started an ecommerce business and couldn’t get it off the ground, again losing tens of thousands in the process. After selling his information publishing business in 2012, Brad built a successful consulting practice, Costanzo Marketing Group, which helps business owners, authors and experts grow their business and expand their profits. He believes his “business superpower” is an ability to collect and recall profitable strategies that apply across industries, and connecting and building the right relationships for himself as well as clients. He feels that once these entrepreneurial skills have been developed, you just feel like you have to keep using them. Brad’s top rated business podcast on iTunes, ‘Bacon Wrapped Business with Brad Costanzo: Sizzling Hot Business Advice Guaranteed To Make You Fat… Profits!‘, he interviews amazing high-level entrepreneurs and influencers such as Russell Brunson, Bob Serling, Justin Krane, Kim Snider, Dan Kuschell, JJ Ramberg, Neil Patel, and Cory Gregory, to name just a few. Brad has also been featured in Inc. Magazine, has launched national brands and published 8 best-selling books for his clients. He is a master of creative marketing, copywriting, brand positioning and marketing funnel design. 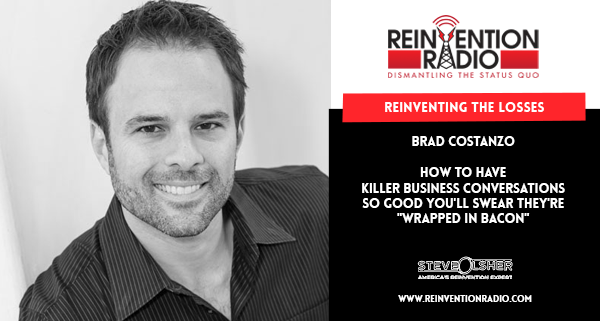 TUNE IN to this episode as Brad chats with Steve, Mary and Richard about how he teaches people how to have killer business conversations that are so good you’ll swear they’re “Wrapped in Bacon”. 2 – It’s all about mindset; You can wallow or move forward; Just jump in and figure it out; Dad will you come help me? 3 – What puts the fire in Brad’s soul? ; Hitting a home run is an adrenaline rush; How do you know when an acquisition will work? ; What’s Brad battling over right now? Reinventing Ageless Passions – In this episode, Karen Putz chats with Steve, Mary and Richard about how to unwrap your passions and create a life filled with joy and fulfillment.